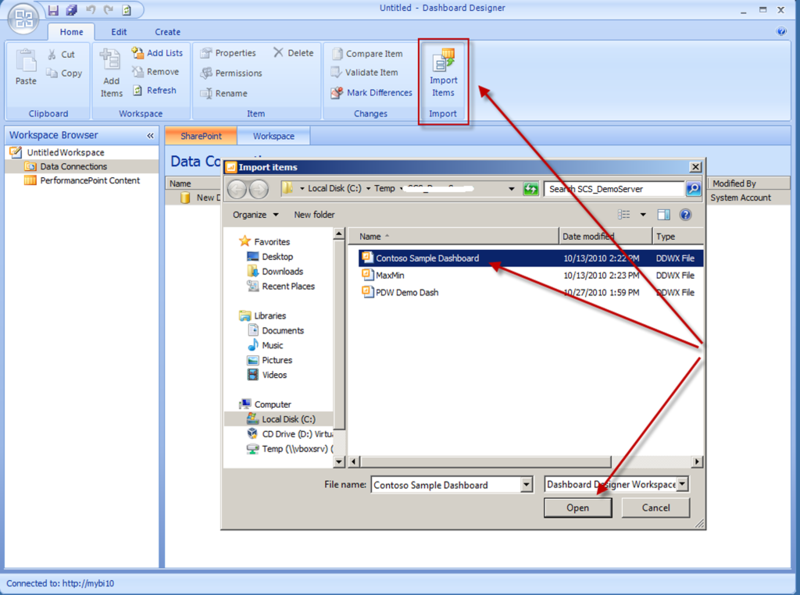 So you created some cool dashboards with PerformancePoint Services 2010 with SharePoint 2010 and now you want to deploy them to a new environment (server). How do you do this? 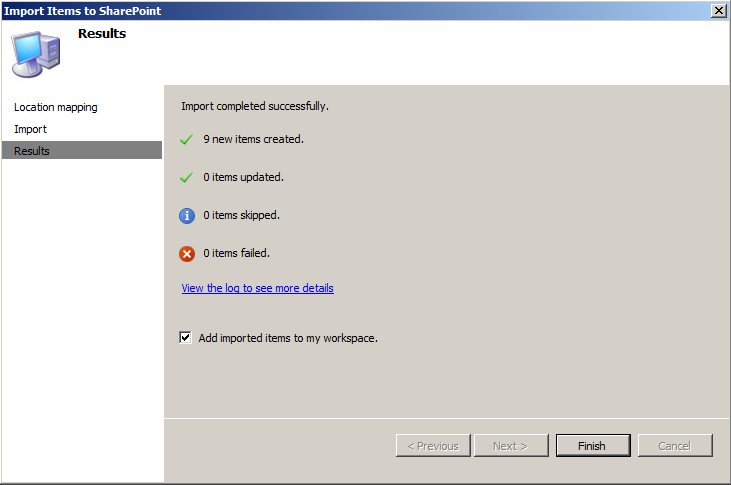 Well with PerformancePoint 2007 there were a couple of options, you could save your work to a workspace file, connect to new environment, and then publish everything. 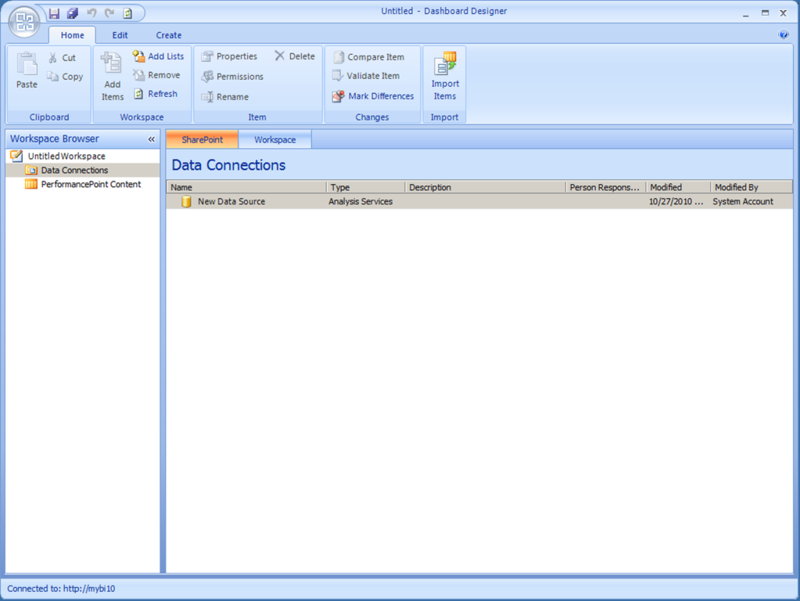 The other option was to use the BI Report Automation Publisher tool available on CodePlex. With the tool you were able to reference a workspace file as well, reference certain items, and make appropriate adjustments for server references. Both were easy options and straight forward for the most part. Now with the 2010 version this has changed. I will have to admit that at first I got thrown for a loop and was confused myself since I wasn’t able to simply use the new workspace file, connect to new server, and save the content. I even tried modifying the file and making environment URL reference changes to try and get the 2007 deployment option to work. Needless to say I initially started to recreate items in the new environments from scratch and I guess I was not the only one. 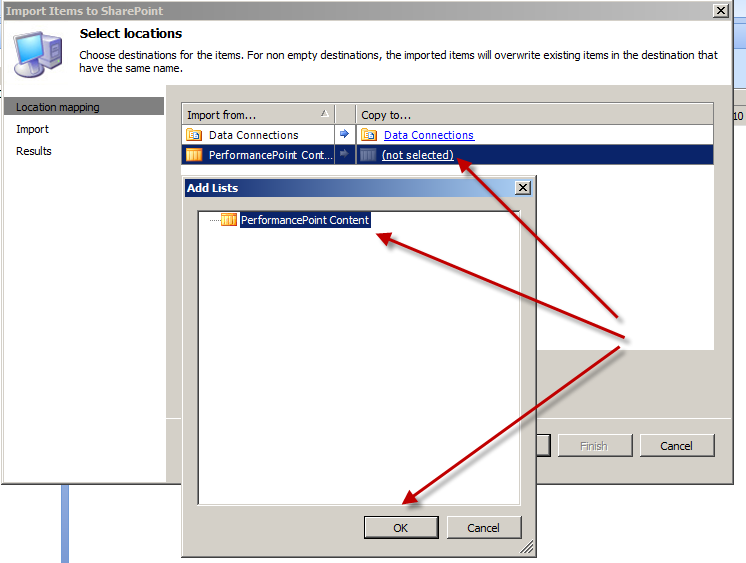 I ended up posting an item in the forums – Deploy PPS 2010 dashboard content to new server – to seek some advice and Umair Khan pointed me in the right direction and refreshed my memory. 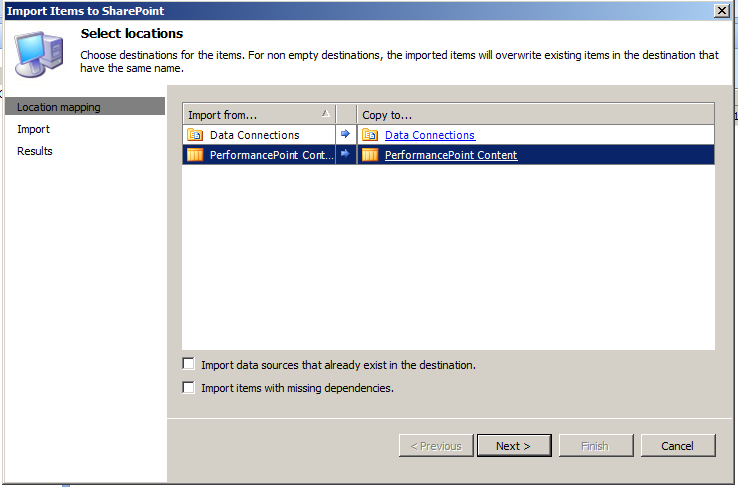 In PerformancePoint Services 2010 we need to start out by opening up Dashboard Designer and connecting to the new environment. Click on the Import Items button in the Home Ribbon of Dashboard Designer and select your workspace file (this will be the file from your other environment that contains the content that you want to migrate and move to the new server). Now you will walk through a wizard to select the content that you want to import to the new server (environment). In this case I am going to do both items and I only have one location for each on my new server that I am moving the content to. The items will now be imported and saved to the specified locations and you will receive a results page. 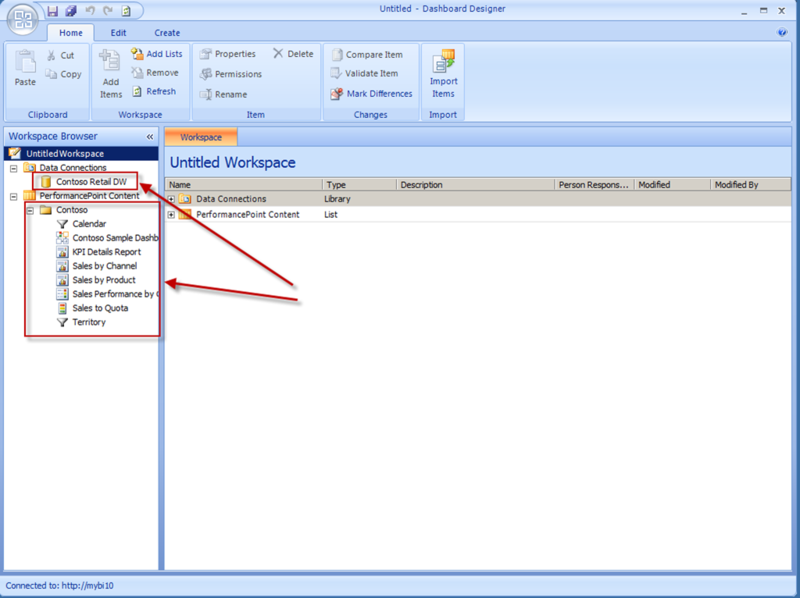 You can then add the items to the workspace and start to make the necessary changes. 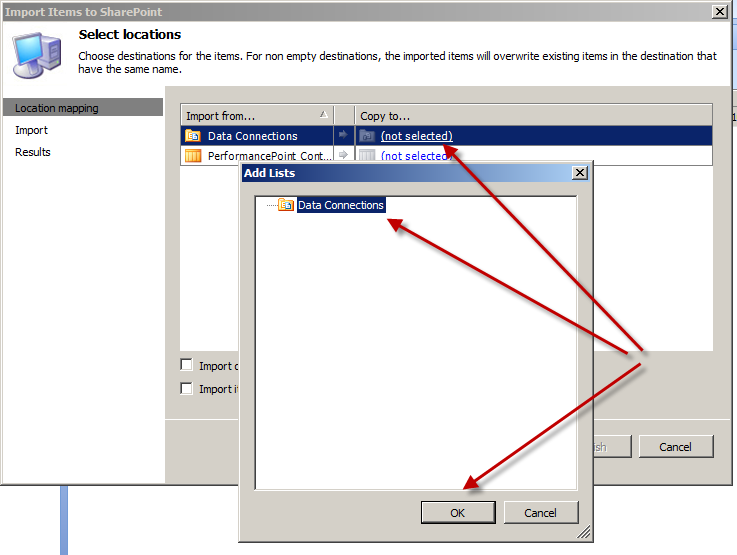 This is similar to the 2007 way where you have to make all of the necessary changes after the fact when you simply connect and publish the items from an existing workspace file. It would be nice if there were some options to make some changes to the connections or report file references, but it does move the content. 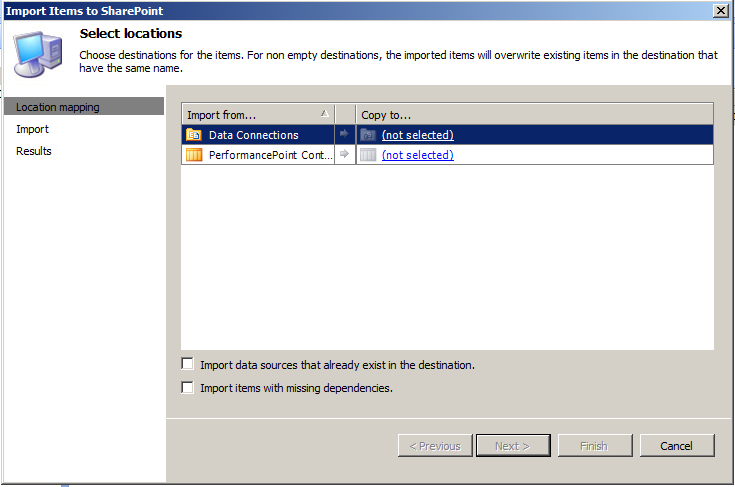 For some more information on this check out the online content here – Import PerformancePoint Dashboard 2010 content from a SharePoint Server 2010 server, site, or list.